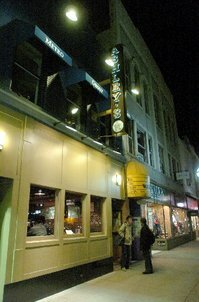 Posted on Fri, Feb 10, 2012 : 12:43 p.m.
Ashley's in Ann Arbor was listed as a 'best beer restaurant' in the annual Ratebeer awards. Ratebeer, a consumer-driven beer rating site, has released the list of winners in its annual Ratebeer awards, and Michigan beers, brewers and restaurants fared especially well this year. Michigan beers took the top three spots in the Best Beers of the United States category. Grand Rapids-based brewery Founders Brewing Co. took the top honors with their Kentucky Breakfast Stout, followed by their Canadian Breakfast Stout and Bell's Hopslam ale. Dark Horse Brewing Co. from Marshall and Warren's Kuhnhenn Brewing also ranked in the top 50. Founders and Bell's also ranked high in the international Best Brewers contest, at numbers two and three respectively. Also cracking the top 100 were Michigan brewers Shorts Brewing Co., The Livery, Kuhnhenn Brewing, Dark Horse Brewing Co. and Dexter's own Jolly Pumpkin Artisan Ales. Ann Arbor's Ashley's made the list of Best Beer Restaurants, a list that also included Slow's Bar-B-Q in Detroit and The Clarkston Union in Clarkston. You can find the full list of winners on the Ratebeer site. The Ratebeer awards are based on the reviews of "tens of thousands" of Ratebeer users from more than 60 countries over the past year, including 79 master beer tasters. Fri, Feb 10, 2012 : 8:02 p.m.
Love both of these establishments - Jolly's truffle fries and Ashley's potato skins are also not to be missed. Congratulations! We are indeed blessed in our area... as I've been saying for a few years now! Support your local brewers/beer bars!